An overview of June Lake Oh! Ridge campgrounds in California with photos, tips and things to do around the campsite. June Lake’s Oh! Ridge Campground is north of Mammoth, California and located in the Inyo National Forest of the Eastern Sierra Nevada Mountains. There are several campgrounds located around June Lake. Oh! Ridge campgrounds are located on the north side of the lake and are operated by Inyo Recreation. Oh! Ridge offers sites for both tent and RV campers. Oh! Ridge Campgrounds in June Lake are some of my favorite. 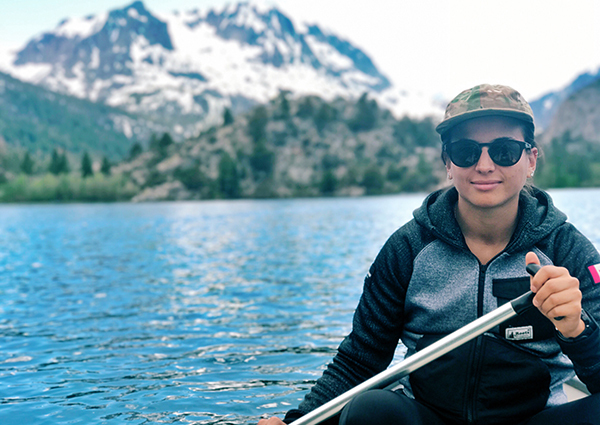 They are located about 25-30 minutes north of Mammoth Mountain and are settled between an amazing view of a mountain range and lake. 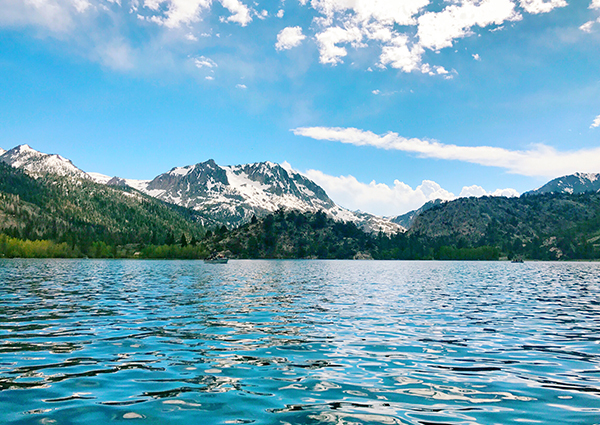 Besides providing unbelievable views, June Lake offers a wide variety of activities. I loved how many activities were available in such a close proximity to the grounds. It made planning out our days super easy. The lake allows visitors to fish, go canoeing, swim, or spend a day boating around. The grounds are also close enough to Mammoth and Yosemite to enjoy day trips to either. The grounds themselves as well as the restrooms were very clean. We stayed over Memorial Day weekend and the campsite was completely full but the restrooms were kept clean for the most part. The spots are pretty close together with little to no privacy and if you have a few rowdy neighbors it can get loud late into the evening. There are also no hook ups or dumpsites for those looking to bring their RVs. Oh! Ridge also does not offer any shower facilities but you can venture to the RV park nearby and use their coin operated showers. I am not sure if it was just the time of the year we were there but we did experience some pretty major wind gusts. I believe it has to do with where Oh! Ridge is located off the lake and near the mountains that causes the gusty winds. Check out the local brewery in the Town of June Lake. It’s not far from the campgrounds and it definitely had an awesome vibe going for it! There’s also a few places to grab food that looked pretty good as well but we stuck to cooking at the campsite. Make sure you bring a cooler that will fit in the bear box along with your other food since it is bear country up that way. Definitely bring fishing gear if you have it. 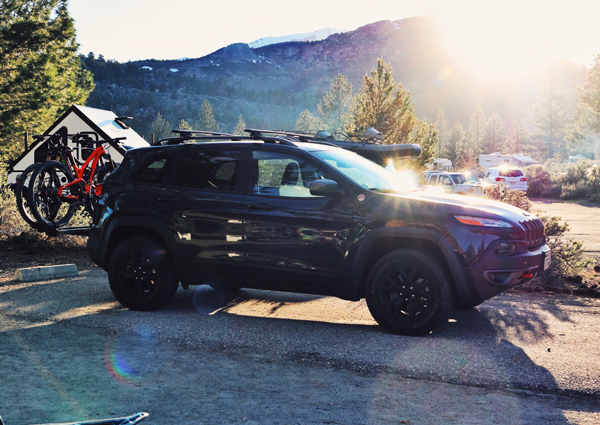 You can rent everything you need in town but it would save on cost by bringing your own gear. The Oh! Ridge Campground in June Lake is one of my favorite places to camp in California. There are tons of activities and you cannot beat the views. The location is also great for exploring the nearby National Forests and Parks. Overall, this is a fun place to take a group of friends or your family to get away from the busy city life. 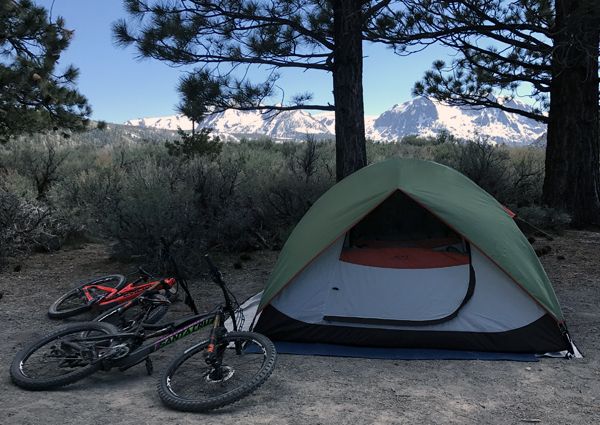 the loop is great, but camping in mammoth is BEYOND rad…. way more options and the MTB bak is slick…. of course it can get a bit busier because of that!!!! im biased though… been going there since I was born. agreed on june lake brewing too… that place is great!